Quoted prices are based on a FULL truck loadOur Residential pricing is based on volume - how much space your junk takes up in our truck and not by the time it takes us to remove your junk! It includes labor (loading your junk from anywhere on your property), dumping & recycling fees, hauling (transportation to charities, recycling centers, or State approved landfills), general clean up, and taxes. It does not apply to hauling construction, renovation, and demolition debris. Our Commercial pricing depends on the nature of your project. Sometimes we base the price on the space taken up in our trucks and at other times (majority of the cases) we quote you a price for doing your “project” and not based on how many truck loads we take or how long it takes us to do the job. Please email us the specifics of your project for a free estimate. We honor the price quoted to you prior to your appointment and there are never any hidden fees or surprises! All of our trucks are 20 Cubic Yard open top dump trucks (dump bed dimensions of 14' X 8' X 5 = 560 Cubic Feet). 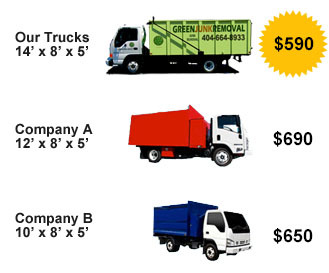 If shopping around for the best junk removal & recycling rates in Atlanta GA, please keep this in mind since most of our competitors use 16 or 17 Cubic Yard trucks. You will get much more value for your money with our larger trucks! These are companies that already trust us with their recycling process. Do join them.